Yup, you're definitely trying to tell me something. Nine of these posts involve food, nine involve DIY or crafts, six involve both food and crafts, and five are compilations (want me to draw the Venn diagram?). A couple of weeks ago, I was in need of some inspiration. I just couldn't. Could not. Come up with a menu plan for the week. Have you been there? Nothing sounded good. Except tacos. And Hubby frowns upon us having tacos for 7 nights in a row. What's a girl to do? I took it to Facebook. I listed the meats and veggies I had in the house, along with the fact that we had a whole fresh pineapple that needed to be eaten soon, and within hours I had several great suggestions, some of which we tried that week. My favorite of those suggestions was from my fraternity sister, Bert, who suggested Chicken Chili Verde from LowCarbGal. I was skeptical. My kids don't eat beans (a tragedy, I know), and it says "chili" right there in the title. No mention of beans what-so-ever. 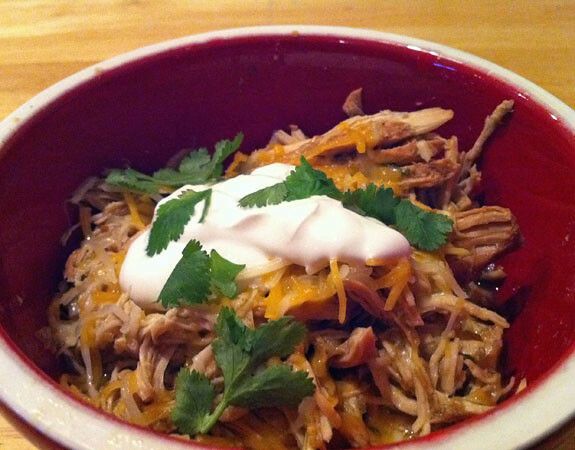 And there are also no beans in this perfectly spiced shredded chicken, which is made in the slow cooker. The chicken can then be eaten plain or used with your favorite toppings for tacos, nachos, tostadas, or even for soup. Everyone liked it, and everyone ate it in a slightly different way. Thank you to LowCarbGal for the recipe! Place the chicken breasts into your slow cooker. Add the onion, bay leaf, pepper, cumin, garlic, jalapenos, chicken bouillon (use low sodium) and salsa verde on top. Cover, set it to low and let cook for 9 – 10 hours. When time is up, take a fork and shred the chicken right in the slow cooker. Serve with sour cream, shredded cheese and chopped cilantro on top. Merry Christmas, my friends! Blessings to you and your family on this holiest of days! One of my favorite ways to count down to Christmas is to wrap up all of our children's books that have Christmas or winter themes, and then open and read one as a family each day in December until, on Christmas day, we open a wrapped Bible and read the Christmas story, as told in Luke 2. It's so nice to take time, in the busy-ness of the season, to sit quietly (or, some of us sit not so quietly) together as a family, reflecting on what it's really all about, and this practice ensures that we don't miss out on reading any of our favorite Christmas stories in December. We're actually not counting down this way, this year--I brought out all the books at once and Bubby and I have been reading them daily. I always tear up as I read those words. The welcoming kindness of the animals is so touching, especially in contrast to the cruelty of the world. No room. There was no room in the inn, as Jesus entered our earthly world, and it seems many still declare "no room" in our world for Jesus, in countless ways, unintentional and intentional. My friends, my prayer for each of you this season is that you will make room in your heart, and in your life, for a Little One, who came to save the world. Have you ever had to give your kids medicine? Have you ever forgotten whether or not you've given your kids their medicine? It's a huge issue for me. It's not that I forget to give it, it's that I forget that I've already given it...or not. And I really, really do not want to double dose. I finally bought one of those pill organizers for myself because I kept forgetting whether or not I'd taken my meds yet that day. And that works just fine for my daily medications, but what about for medications that are liquids or need to be refrigerated? Those don't work too well in the little boxes. Bubby is finishing up his second round of antibiotics for an infection today and it's been especially difficult to remember whether or not he's gotten his dose each morning and evening this time around. Could it be that there's something else on my mind? An upcoming holiday, perhaps? That's where today's tip, from The Happy Home Fairy, comes in. Use a sharpie to make a grid on the bottle, and mark off the appropriate square each time you give the med. Remember when I said I don't do windows? I might just have to rethink that. I had revelation last week, courtesy of Money Saving Mom. Crystal shared her 2 hour cleaning plan. Which apparently she's shared before, and apparently I have consistently ignored when she's shared it before. I mean, other people's cleaning plans? They rarely work for me. So why would I take the time to read yet another? But for some reason, I did, and that's when it jumped out at me. Click here and see if you can spot it. Go on. I'll wait. Did you see what I'm talking about? First of all, what a great plan. Seriously, sometimes don't you just need someone to tell you where to start? And what order to go in? My number one difficulty with cleaning is I don't know where to start. I don't know how to decide which messes take priority over the others. And then I keep getting distracted. Take some window cleaner and spot clean the main glass windows/doors/mirrors (3 minutes). Spot clean? I can spot clean those puppies? In 3 minutes? Wha? Why? Why have I not thought of this before? You see, the biggest obstacle to me cleaning windows is not actually that my kids will make them dirty again. I mean, I wash their clothes and dishes and clean the bathrooms and vacuum all the time, and those are dirty within minutes, too. No, the biggest obstacle is that it's so much work. We have beautiful wood lattice-work on our windows, so in order to clean the windows, I either have to clean each little rectangle separately, which is a royal pain, like washing 16 windows instead of one, or take the lattice out, which is also a royal pain because it doesn't come out easily and the little clips break or fall out. But not anymore! Not now that I know I can clean just the spots that need cleaning. I can spray cleaner on my paper towel or microfiber cloth or whatever, and clean just the parts that need cleaning. So, it's almost Christmas. And you're still looking for a few last minute gifts. Well, I am here for you, my friends. Amazon has got thousands of items available with free 1-day shipping. That means if you order them by the 23rd, they will arrive in time for Christmas. Click on the banner or link below to browse available items. To avoid being charged the $79 membership fee, simple cancel your free trial before the end of the 30 days. Although after taking advantage of these benefits, you might decide it's worth continuing. Still not finding what you want? Or don't have time to browse around? 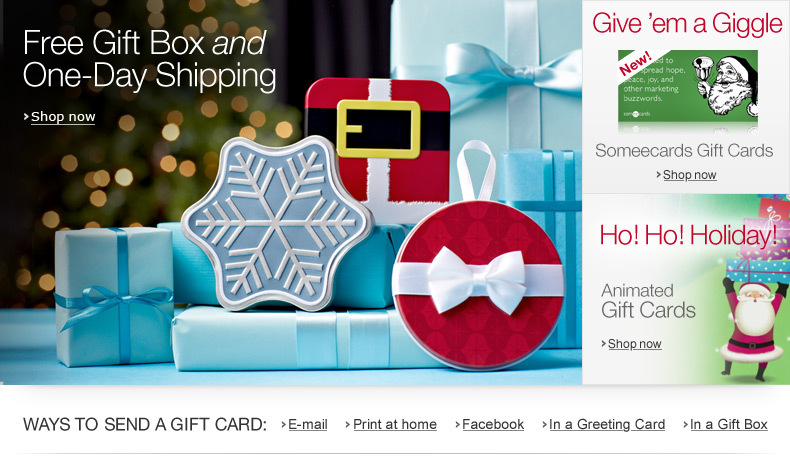 Go with the gift you know they'll love: an Amazon gift card. For a limited time, receive a free gift box and free one-day shipping! Click on the banner or link below to find the perfect gift. Remember waaaaaay back, like 2 years ago, when our family went on a loooooong road trip, that ended up being even longer than we intended? And remember how I promised to let you know how we survived all that time on the road with our kiddos ? Yeah. That hasn't happened yet. I figured out why. It's because it's too much to include in just one post. So, with many of us planning to hit the road in the next week or so, I thought I'd share one little gem that has been a lifesaver for us on more than one occasion. That's right: they don't just reinforce nouns and verbs, adjectives and adverbs, they're also quite silly and fun, and a great way to ease tension and pass the time in an enclosed, moving vehicle. We keep half a dozen Mad Libs books in our vehicle at all times. Even our youngest passenger enjoys filling in the blanks (he doesn't know what the parts of speech are called, but we just explain it to him. Oh yeah, he's learning, too!) and listening to the resulting hilarity. Want to save a little money? Don't have time to get to the store before setting off on your road trip? There are tons of printable mad libs online. Just check with your favorite search engine. My parents, like many people, don't need any more stuff. But it's Christmas, and I wanted to give them a gift. Do you have anyone on your list who's impossible to buy for? You want to give them something, but you just don't know what? I've had this dilemma for years, and usually in the past I've solved it by donating to charity in their honor. And for my parents, that's a cool gift. I think they like that they raised their kids to be generous. But I still just wanted to give them something. Some thing. I bounced around some ideas with my friend J while we were walking one day. More than one day, actually. One by one, I rejected J's ideas, but she's resilient. She kept coming back with more. Thank you, J, for not giving up on me! The perfect gift idea for someone who doesn't need any more stuff is something they'll use up. Like an experience, or postage stamps, or food. My parents aren't all that in to experience gifts, and postage stamps are definitely a last resort, so that left me with food. I don't necessarily like giving food gifts, especially at Christmas, because number 1, there's already so much food around at this time of year, and number 2, pretty much everyone I know is trying to eat healthfully--I definitely don't want my gift to sabotage good intentions. But we finally settled on a themed gift basket full of fun, and healthy, breakfast foods. These are things that I know they'll use and appreciate, and it's not just more stuff. And...I wanted to take a picture, but forgot, so...sorry. You'll have to make due with a list. Obviously, if you're going to make a gift basket for someone, tailor it to their tastes--these are things I know my parents will love. I used different types of containers to package the mixes: some mason jars, some peanut butter jars, some plastic bags, and some plastic bags inside paper bags. I wrapped some of the items in color coordinated papers and left some unwrapped. It was a thing of beauty, I tell you. I think they liked it. And I know they'll use it. And that makes this the perfect gift. Oh, how I wish y'all could have smelled my house when I was cooking up this blueberry syrup. So fragrant and fruity. I don't even particularly like blueberries and my mouth was watering. My parents shared some of this with the group while they were visiting--by all accounts it was very yummy, particularly when combined with redi-whip on top of homemade whole wheat pancakes. Combine 1 quart (about 1 1/2 pounds) fresh or frozen blueberries, 1 c. sugar, 1/4 c. bottled lemon juice, and 1/4 c. water in a non-reactive pan. Store in refrigerator in a covered container for up to 3 weeks, or process half-pints in a water bath canner for 10 minutes. Note: fruit syrups are typically thin. If a thicker syrup is desired for serving, combine 1 c. blueberry syrup and 1 T. cornstarch in a small pan. Bring to a boil and simmer until the mixture thickens. Do not add cornstarch prior to canning. Have you been there? Have you taken a bite so large you can't chew it? Our kids have, from time to time, and let me tell ya, it ain't pretty. Because when your mouth is so full that you can't even chew, the only thing you can do is spit something out. And spitting things out is wasteful and no fun, so it's better to take more manageable bites. And while it might take longer to finish eating if you're taking smaller bites, you will, at least, be able to finish. True with food; true with other obligations in life. When my plate is full, so to speak, of obligations, so many that I'm not able to fulfill them all, it's paralyzing. I look at my schedule and realize I've got too much to do, and instead of taking a step, just one step, I shut down. All I can do at that point is spit out some of my obligations. It's why I try to build a little bit of grace into my schedule, so I don't have to renege on commitments that are too much to handle. It's why I take smaller bites of life. I may not be able to do everything I'd like to do right now, but I will get to it eventually, and have a much more pleasant experience along the way. And speaking of bites and obligations, we have the final Christmas treat line-up. Little Cookies and Turtle Thumbprint cookies also made the list, but I had to let go of them. I even got as far as making the dough for the Turtle Cookies before realizing it was too much. It's in the freezer, and I'm sure they'll taste just as good in January. 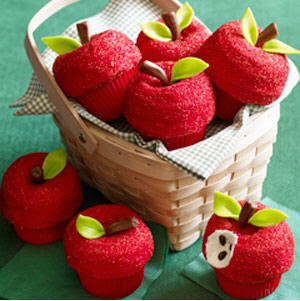 Even better, perhaps, because they're not in competition with all the other delicious treats. So here's how the progress stands as of this moment. 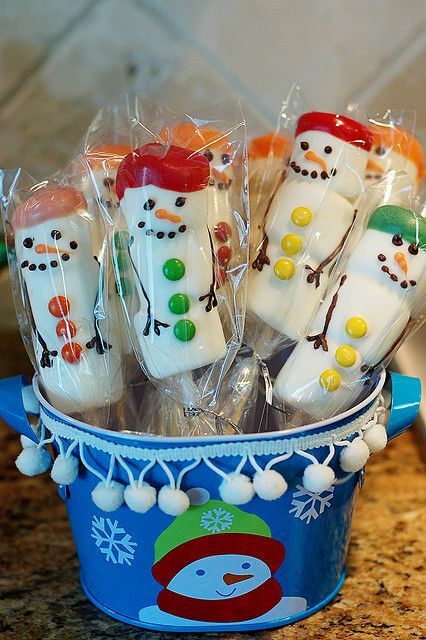 The Tree Cake Pops, No Bake Reese's Bars, Oreo Snowman Faces, Double Chocolate Peppermint Crunch Cookies, and Marshmallow Snowman pops are done. Completed. Finis. The dough for the swirly sugar cookies is ready to be sliced and baked. The snickerdoodle dough is made, but still needs to be shaped and baked. The oreo truffle innards are chilling but need to be dipped, and the Nutter Butter Reindeer are still but a twinkle in my chocolate-loving eye. 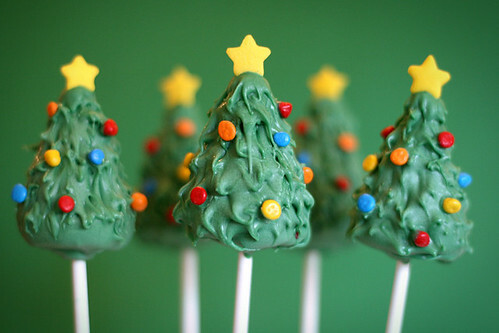 How are you doing with your Christmas preparations? Did you bite off more than you can chew? Feel free to spit some out, my friends. You'll savor it more if there's less on your plate. Me? I'm gonna go take a nap. *Hugs* everyone! 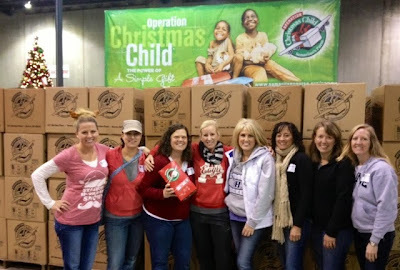 For many years now, I've been involved with Samaritan's Purse packing shoeboxes for Operation Christmas Child. If you're not familiar, Samaritan's Purse collects Christmas gifts for children all over the world. Small toys, school supplies, and hygiene items are packed into shoeboxes. Over the past 20 years, over 100 million children in over 130 countries have been blessed by receiving a box. For the past 4 or 5 years, I have wanted to volunteer at a shoebox processing center--ever since I learned of their existence. At the processing center, volunteers take out any inappropriate items, add filler items if needed, tape up the shoeboxes and pack them for shipping. When a volunteer at the processing center closes the box, the last thing they see is the first thing a child will see when opening his gift. Last week, I finally got the opportunity to go, along with a group of moms from my kids' school. What a good looking group we are! Beautiful, inside and out. Want to be more like them. We heard lots of stories while we were at the processing center, a couple of which really touched my heart. There was the story of a shipment that was delayed for months. Weather, customs, and other delays kept happening until finally it was August and the shoeboxes arrived at their destination. August! There was one little girl who was particularly disappointed by all the delays. She was so excited to finally be receiving her shoebox, and when she opened it up, there were balloons, streamers, noise makers...all kinds of supplies for a birthday party. Another shoebox made its way to a little boy in a small village in Africa. He opened up the box and inside there was...a bunch of white socks. That was it. A box full of white socks. The volunteers who were helping with the distribution tried to take the box from him and give him another one, but he wanted to keep it. Turns out this boy had burned his feet severely, and needed clean socks to protect them from infection. God knows which box is meant for which of His children and will get it there in His perfect timing. We were so blessed by our time in the processing center, and we are definitely planning on making this an annual outing. I want to urge you to help with this incredible effort by packing a shoebox, volunteering at a processing center, or donating money--it is such a worthwhile endeavor, and a mighty blessing to the children, their families, and their communities. It takes just a little love to make a huge difference in a child's life. To help you out, below I've shared just a few of the things we learned about packing shoeboxes after sorting through hundreds of them in a few hours. For more information about Samaritan's Purse and Operation Christmas Child, click here. Consider packing a box for an older or younger child. When packing a shoebox, you get to decide if it's for a girl or a boy, and there are 3 age categories to choose from. By far the most common boxes we saw were for 5-9 year old girls, followed by 5-9 year old boys. It makes sense--that's the easiest age to pack for--but as a mama to two boys in the 10-14 category, it made my heart heavy to think about all those older and younger children either not getting a box or getting a box that is not age appropriate. Not sure what to pack for the older kids? Try items that will help them learn a skill or earn a living. We saw a great box for an older boy that had hand tools, bungee cords, and fishing equipment in it. Consider a sewing kit and some fabric for an older girl. The only food items that can go in the boxes are hard candies and gum. We had several boxes come through that were jam packed with yummy things like Pringles, Cheez-its, and Rice Krispie Treats, which all had to be taken out of the boxes. Even fruit snacks can't be sent in shoeboxes. It made us so sad to think about someone packing all that food out of love, thinking they're doing a great thing, and having it all be a waste (items that are taken out of the boxes are donated to other agencies, so the food did help someone, just not in the way intended). Do include personal hygiene items, shoes, and clothes. I know they're not as fun to pack as toys and school supplies, but imagine how it would feel to not have a toothbrush or soap. I was surprised by how many boxes did not contain these basic supplies. Clothes and shoes can be hard to come by, too, and we heard so many stories of seemingly random items going to exactly the right person. Just do it. Another thing to think about--if you're packing a box for an older girl, consider packing feminine hygiene supplies. Think about how items will be used. We had a lot of boxes come through with art supplies, like colored pencils or crayons, but nothing to write on. 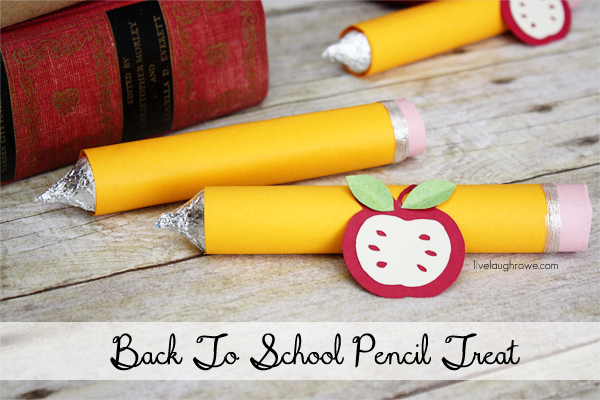 Do pack school and art supplies, but consider how they will be used and make sure you pack paper to write on and a pencil or crayon sharpener. If you pack a flashlight, pack extra batteries, or pack one that's crank-powered. Just think about how an item will be used long term. If you live near a processing center (Atlanta; Charlotte; Boone, NC; Denver; Honolulu; Minneapolis; Orange County, California; Dallas/Fort Worth) , consider dropping off a bunch of filler items, rather than packing shoeboxes. When we needed to remove something from a shoebox, or a box came through that was kind of empty, we would put a filler item or two (or ten) into the box. We had one box come through the line that had colored pencils in it. That's it. Just one box of 12 colored pencils. So we filled it up with filler items, but, and sorry if I offend you by saying this, but the filler items sucked. Seriously. There were these weird plastic things that even we didn't know what they were for, some ball-point pens, just weird random stuff that no one wanted so they donated it to Operation Christmas Child. Next year, instead of packing several boxes, I will pack just one or two, and then donate a bunch of filler items. I know lots of people like to pack gift items in plastic shoeboxes, and that's a great idea because the container is reusable, but consider this: It costs Samaritan's Purse the same amount of money to ship a container of shoeboxes whether it contains 9 boxes, or 22 boxes. Plastic shoeboxes are bulky and oddly shaped and take up more space in the container, so we can't pack as many per carton. In addition, many of the plastic boxes are already cracked by the time they get to the processing center, and can't be used anyway. A great compromise is to use a sturdy cardboard shoebox, and pack a lightweight reusable tote bag inside. We all have way too many of those anyway. Also consider the size of your box. We saw some boxes come through that were huge! They must have contained boots. And I know the donors thought bigger is better, but all we could think about was that we could have made 3 regular size shoeboxes from that one big box. And how about the kids who receive the boxes? It's great for the kid who gets the big one, but how does everyone else feel about receiving the smaller ones, after seeing one child get a big box? This is a great feature. Samaritan's Purse asks for a donation of $7 per box to help with shipping costs. It's completely optional, and even if you don't donate, your box will get to the child it's meant for, but if you make your donation online, you can then print out a barcode label for your box. The barcode will be scanned in the processing center, and when your box gets to where it's going, you'll get an email saying where it went. So cool, and a great way to help your kids learn about geography. I was the scanner person for most of our shift, and while I had lots of barcodes to scan, I was surprised that there wasn't a higher percentage. You might be wondering why I'm telling you all this right now. After all, the national shoebox collection dates have passed, so unless you live near a processing center, a box packed now will have to wait until next years' collection. Well, yes, that's true, but consider shopping year 'round for shoebox items. You'll be able to pick up items inexpensively if you're always checking for clearance items and sales, and you'll spread the cost out over the year as well. If you end up with too much stuff, remember you can donate it to be used as filler items, or just save it for the following year. Finally, consider shopping for a cause. As you know, I'm an Amazon affiliate, which means that when you make a purchase through my links to Amazon, I will receive, at no extra charge to you, a small commission. This year, my commissions are going to Samaritan's Purse and Operation Christmas Child. So far this year I've earned over $120 in commissions for Operation Christmas Child, thanks to all of you! So if you have any last minute Christmas shopping to do, please consider going through my Amazon links. Did you know that it was national cookie day last week? I know! I really wish they had given me a little more warning, so I could properly prepare. Luckily, cookies are never far from my thoughts, so even though I only heard about national cookie day that morning, I was able to whip together this delicious concoction with ingredients I already had on hand. These chocolate cookies are soft and delicious, chewy with a slight peppermint flavor infused throughout, and little pockets of peppermint crunch and semi-sweet chocolate goodness. 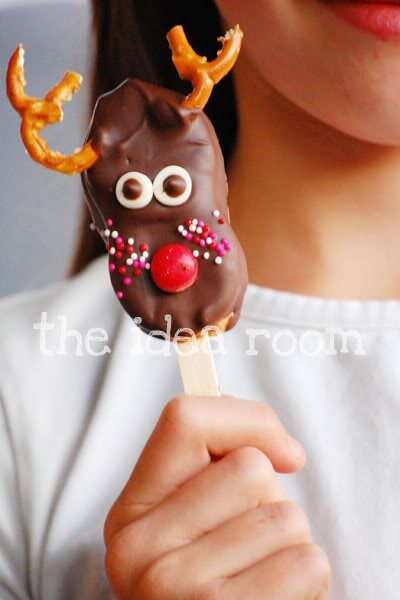 Perfect at Christmas time, or any time of year. Preheat oven to 350 degrees F. Melt butter or margarine (I used 1/2 c. of each) and cool to room temperature. Sift together flour, cocoa, baking soda, and salt. Set aside. so Beat together butter, sugar, brown sugar, and vanilla in large bowl until creamy. Beat in the eggs. Gradually stir in the flour mixture 1/3 at a time, just until blended. Stir in peppermint crunch, chocolate chips, and nuts. Drop rounded tablespoons of dough 2 inches apart onto an ungreased or parchment lined baking sheet. Bake for 10-12 minutes, until edges are set. Allow to cool on baking sheet for about a minute, then transfer to wire racks to cool completely. 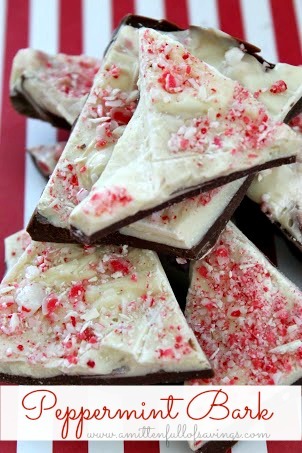 * You could also use Peppermint Crunch Andes candies, chopped. 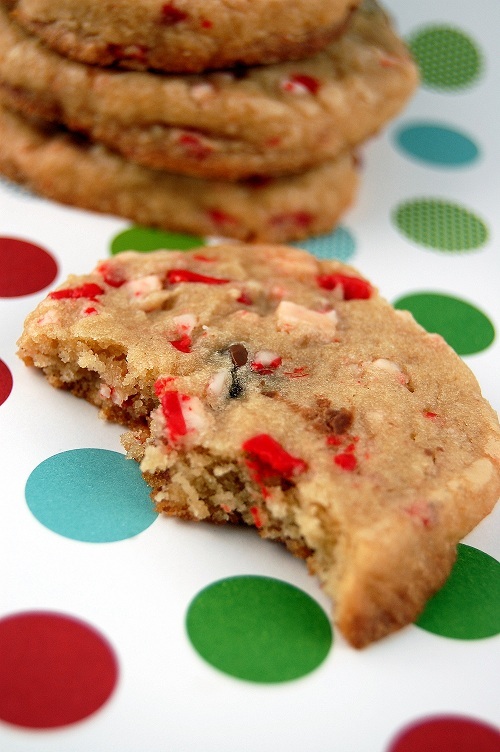 You might be tempted to use crushed candy canes in this recipe, and while that would give you a delicious peppermint flavor, I would advise against it, because the candy canes will melt, leaving holes in the cookies. AKD wants to make a hammock. AKD, my thirteen year old son, wants to make a hammock. I love that he likes to make things--some people would find such a task too intimidating--not my boy--he knows he can do anything. It started in August, when we gave Hubby this hammock for his birthday. AKD fell in love immediately...but he didn't love the price tag. What's a boy with limited earning opportunity to do? Make it himself, of course. Resourceful, that kid. 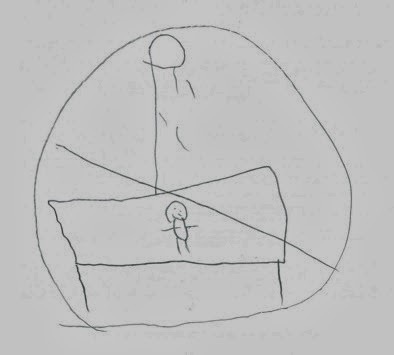 My boy made a plan and a budget for the project, and then went about raising funds. The budget hinged on getting his material for at least 40% off--totally doable, considering that the fabric store honors competitor's coupons and the competing craft store has 40% off one regularly priced item coupons out all. the. time. His grandparents gave him a combination of money and a gift card for Christmas, so he was all set. AND the fabric store had a 60% off coupon out right after Thanksgiving. Score. We set off to get AKD's material, so excited that the project was finally under way. We arrived at the fabric store, scooped up the fabric, and AKD dutifully waited in the cutting line with his bolt. When it was AKD's turn, he confidently strode to the counter and asked for 3 and a half yards. The fabric cutter then informed my boy that the fabric was on sale. On sale is usually a good thing. I mean, my mantra. Why pay full price when you don't have to (and you very rarely have to)? But did you catch that thing up there about the coupon being good for a percentage off a regularly priced item? Yeah. That. The coupon could not be used on the fabric because it was on sale, so the sale price placed that material firmly beyond AKD's budget. Ugh. The one time you don't want something to be on sale. I totally tried to get them to charge us full price. It's not signed as being on sale, I said. Surely, they can adjust the price for us at the register, I said. But no. The could not, or would not. AKD thought I must be feverish or something, and I must say, I did feel a little ill.
And so we wait. I'm checking the price online once or twice a week, hoping for it to not be on sale. And every time I check, that link to a printable 40 or 50 % off coupon is just taunting me from the top of the page. Still on sale, by the way. For a better price now than right after Thanksgiving, but still beyond the budget. As I mentioned, we had a houseful of guests for Thanksgiving. Prior to their arrival, I sent out a poll, asking them to indicate their one or two favorites from a list of dessert choices. Because, as we all know, dessert is the most important part of the meal. So important, in fact, that we had dessert for supper on Thursday. Just dessert. Only one person responded, which I took to mean they were leaving dessert selection up to me. No worries. I can deal with that. We ended up having pumpkin pie (Hubby's choice), brownie pecan pie (ShepGDad's choice), and this little gem I stumbled upon that wasn't even part of the original poll. This stuff is so, so, so yummy. Seriously delicious. Even more delicious, in fact, than it sounds, if you can believe it. Bake a chocolate cake in a 9x13" pan. You can use a mix or bake it from scratch. Or get your sister in law to make it. Whatever works. When the cake is cool, use the handle of a wooden spoon to poke holes in the cake, about an inch apart. The more holes, the better, in my opinion. Over the holey cake, pour a mixture of one 14.5 oz can of sweetened condensed milk and 1 c. liquid peppermint dairy creamer (I used Coffee Mate's Peppermint Mocha flavor--don't worry, there is no mocha, just peppermint), taking care to make sure most of the mixture goes down into the holes. To accomplish this, I usually use a glass measuring cup to mix it. Then I can use the cup's pouring spout to direct the flow into the holes. Whisk together one 12 oz jar hot fudge sauce and 1/4 c. liquid peppermint dairy creamer. Yeah, right. Have you ever tried to whisk room temperature hot fudge sauce? Here's a tip: heat it up first. Add 1 c. crushed oreos to the mixture, and spread on top of the cake. Are you still with me? Amazing already, isn't it? On top of the fudge mixture, spread an 8 oz container of cool whip. 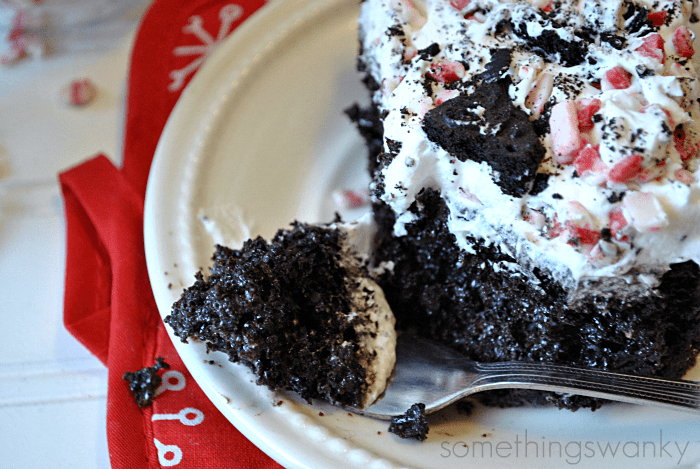 Sprinkle with Andes Peppermint Chips (the pink ones--we found them at Walmart, of all places) and crushed oreos, as much or as little as you want. OK, maybe not quite as many as you want, depending. Just make it look good. 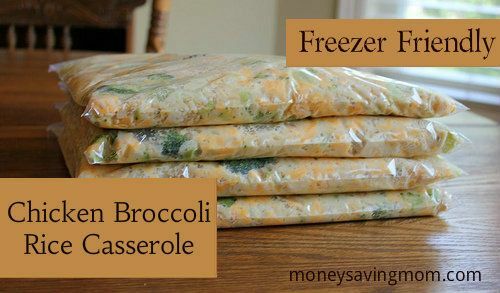 Cover and refrigerate (or throw it in your auxiliary refrigeration unit, aka the screen porch or garage) for several hours to allow the flavors to blend. P.S. Right now you can print a $1 off coupon for Coffee Mate Creamer. Just click here. P.P.S. You can use the leftover Peppermint Mocha Creamer in your hot chocolate. A-maze-ing. I don't know why I'm surprised that it's actually working. Probably because of all the times I've made the appointment, but haven't written it down and it hasn't happened. Anyway, on Monday I mentioned that this week is quite possibly the busiest week I've ever had. I used to have a full time job and I think this is busier even than way back then when I was commuting for an hour each day and working for 8.5. One of the things that's making me busy is medical type appointments for my kids. Yup, all three of them have appointments of one kind or another this week. Bubby went to the dentist on Tuesday. AKD has a vision appointment later today. And MC is having surgery on Friday. Oral surgery, that is. But still, it involves not eating or drinking (even water) for 6 hours before his appointment because he's undergoing general anesthesia. It's a fairly routine procedure, but, even things that are routine have ample opportunity to go awry. MC has extra teeth. We're thinking somehow some shark DNA got spliced into his genome. Maybe during that summer I was cloning dinosaurs? His upper front middle baby teeth fell out as normal, and his permanent teeth grew in, but MC also has two extra unerrupted teeth up there. The worry is that they will continue to develop and cause problems for his permanent teeth, so out they come, bright and early Friday morning. General anesthesia is necessary because they're going to cut an incision in his upper palate right near the gum line, and then drill the teeth out. And when one's upper palate is being cut open, it's a good idea to be perfectly still. We're all ready with the Tylenol with codeine and the soft foods, and the DVDs are all lined up for the movie marathon. Now all we need is a covering of prayer. You can even exercise while you do it. Well, as you know, in addition to starting a new decorating trend, Hubby and I are making some changes in our bedroom, including painting the walls. It is absolutely amazing to me how much better the room looks with a fresh coat of paint. Seriously. Such an easy and inexpensive update. So worthwhile. And...apparently I have a water spot on my camera's lens. And exposure issues. If you're one of my Facebook friends, you know that we were having a bit of a crisis over here when we decided to paint the wall behind the bed a gorgeous shade called Red Delicious. Apparently, red is the most difficult color to paint. Why no one told me this before we decided on our colors, I may never know. And just so you know, don't panic when your first coat comes out all blotchy. Just keep applying the paint in even strokes from floor to ceiling, and if it's not already too late for you, gray is the best primer for reds. Five coats later, our wall is just the color I wanted it to be--I love it. And yes, you read that right: five coats. Hubby definitely deserves an award. Anyway, I wanted to share a little tip I picked up for creating clean paint lines, like, for instance, between the walls with your main color on them and your accent color wall. You can use painters tape, but sometimes a bit of the paint still seeps under and it ends up just looking messy. 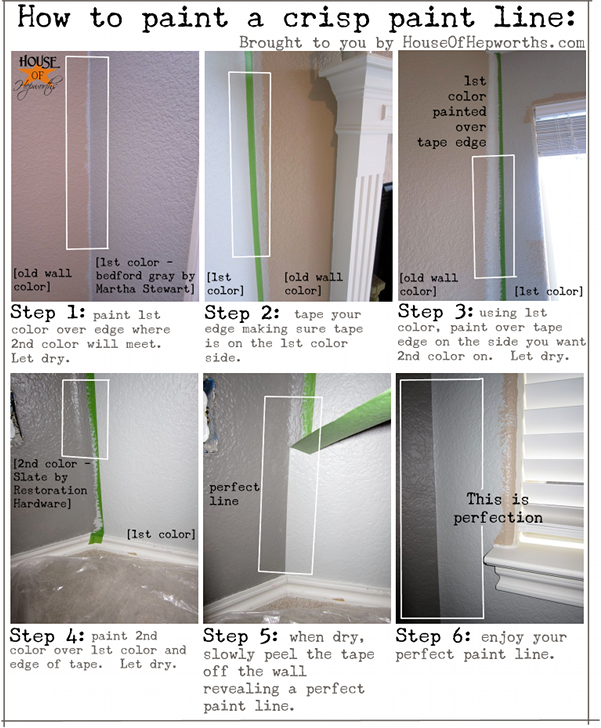 Head on over to House of Hepworths for the simple how-to. Uffda. My head is spinning. Our November ended with a house full of guests, which was busy and wonderful and loud and joyful and went by way too fast. But it was a little disorienting to wake up this morning, after spending several days outside of our normal routines, and launch straight into one of the busiest, craziest week of the year. My feeling of seasonal confusion was compounded when I realized that our kids' winter break begins in less than 3 weeks. That means that anything I want to do before Christmas I need to get done in the next 18 days. I have so much I want to do between now and then! Since Thanksgiving weekend was just, well, yesterday, the fall décor is still in place. The Christmas tree is up, and the lights are on, but the ornaments have yet to make their way to the branches. We are uncertain of the condition of the outside lights, and based on our collective schedule over the next few weeks, they might not go on this year. All of the other decorations are nestled snug in their boxy resting places and it is iffy that they will make an appearance. I love all that stuff, I really do, but it'll have to take a back seat to the truly important Christmas preparations. I know! You've been waiting for this all year, just like me, haven't you? 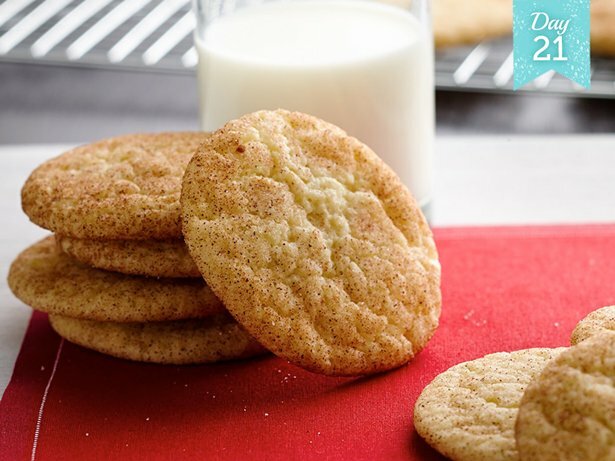 The list isn't final just yet*, but I will tell you that 3 of my boys said they wanted snickerdoodles and one of them said he wanted little cookies. I'll let you decide who requested what. What this means is that number 1, snickerdoodles are a Christmas cookie (who knew? ), and number 2, I get to decide ALL of the other treats! Which is right and good because I'm the one who's making them. 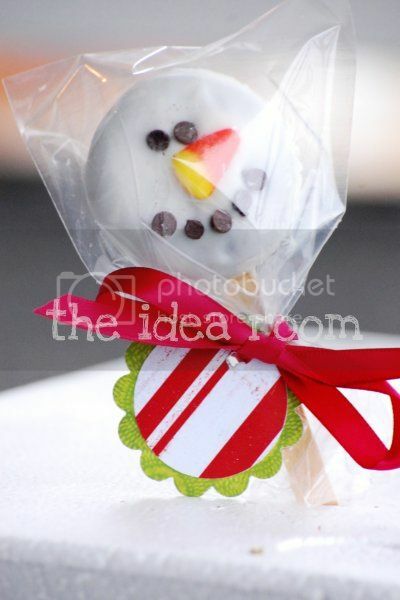 If you'd like to get an idea what I'm thinking, check out my Christmas Treats pinboard, keeping in mind that I've kept last year's pins and I'm not planning on repeating many of the treats from last year.